I’m hoping to order fabric for my bedroom this weekend, but in true Kristi fashion, every time I go to click that “Purchase” button, I start second-guessing myself. I hate that I do that. That’s why we lived in this condo for three years before I decided how I wanted to decorate it. I was paralyzed with fear that I’d make the wrong decision. I try to tell myself, “It’s just decorating, Kristi! These are not life-altering decisions!” But that doesn’t help. In the scheme of things, it’s insignificant. That much is true. But it’s still difficult for me to part with my hard-earned money when I’m not 100% sure of my decision. And I’m seldom 100% sure of my decisions. First things first. I got the sample of the floral fabric that I’ll be using in the room. Here are the fabrics on Sherwin Williams Naval. And here they are on Benjamin Moore Hale Havy. The current antique white paint color in the room is really throwing off the other colors. It makes everything look so yellow and drab. But in person, there’s honestly so little difference between the Hale Navy an Naval that I think I could flip a coin and be happy with the outcome. The only difference I see is that the Naval has a slight touch more blue, where the Hale Navy is a bit more gray. I’m going with Sherwin Williams Naval. That’s the one decision I found to be easy. via Life On Virginia StreetWith the navy blue above it. Then on the big window wall, lots and lots of linen draperies. I don’t want to do the entire wall from corner to corner, because I’d like at least some of the white wainscoting and navy blue wall color to show. But I do want at least double width drapery panels on each side of the window. Room design by Buckingham Interiors + Design, via HouzzAnd then in front of the window, the headboard. As I’ve said a thousand times, I want a combination of wood and upholstery. 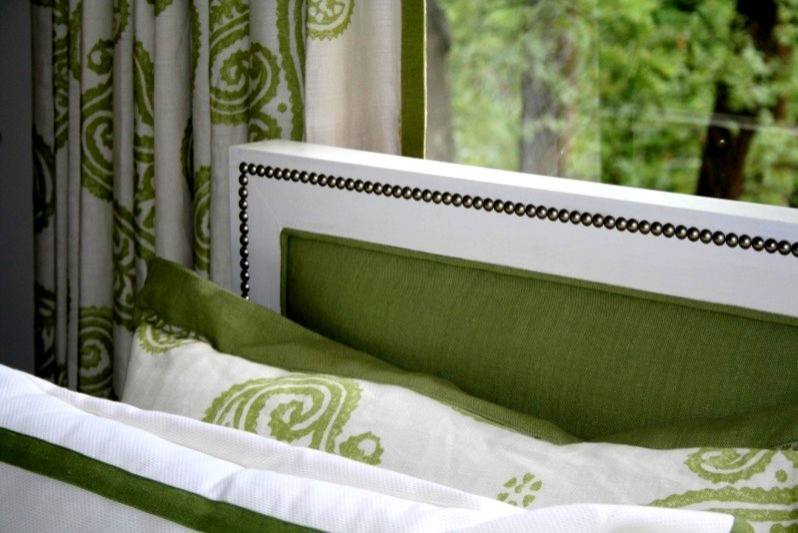 I found this headboard design on Houzz and absolutely love it. Obviously, I don’t want these colors. The wood on mine would be stained, and I’m thinking of using navy blue linen for the upholstery. But I love the design, especially with the nailhead trim on the wood frame. Headboard by Liz Williams Interiors, via HouzzSo I would use a medium stained wood frame with nailhead trim, and navy blue linen for the upholstered part. That would sit against the window with the oatmeal linen drapes. And then the floral fabric would be used for accent pillows on the bed and hopefully something else. It’s to awesome to just use on a couple of pillows. And in fact, that’s where I’m having the difficulty. Is that floral fabric too awesome to relegate to just a couple of pillows on the bed? Should that fabric be more prominent, perhaps used as the draperies instead of the linen? And if I used that as the draperies, would I still use the navy blue linen on the headboard? Or the oatmeal linen? Or flax? I want this room to look peaceful and relaxing, but I don’t want it to be boring, which I fear may happen with a whole wall of oatmeal linen. But I also don’t want it to look too colorful and vibrant with overwhelming pattern, which I’m afraid would happen with a wall full of floral draperies. See what I do? It’s a miracle I ever get any decorating done. The crazy thing is that I could come into your house, and have a very clear plan in place within an hour, and ever second-guess myself. But with my own home, it’s a whole different story. You have made beautiful choices. Think of your choices as candy bars – they all taste delicious, there is no wrong choice. How about the pattern on pillows and a bedskirt or fabric throw at the bottom of the bed? I won’t have a bedskirt (don’t want to cover up the bed I’ll be making! ), but I do like the idea of a throw at the end of the bed. That would definitely add just enough color and pattern without being overpowering like floral draperies might be. I will throw a wrinkle in the plan….but, I would not want to cover up so much of that beautiful wainscoting with curtains…..a single panel would be great. So, the oatmeal color would not be so overwhelming and drab. I would also put the floral as a skinny panel (not a full one) by the oatmeal panels, just for a pop of color. I was thinking the same thing, do a combination of fabrics in the curtain. You could do a skinny panel or make an edge, or a top swag of the floral fabric. You could also make covers for large European pillows of the floral, then have smaller plain pillows in the other two major fabrics. If you have side tables, you could also make a runner of the floral fabric, or a table cover if you have a table. Or upholster a chair seat if you have a chair (or the whole chair). Spread it around in bits. Use bright lights in the room for reading/getting ready to help the colors pop. That’s what I was thinking. A floral border on the linen panels would be perfect. I think the drapes being all floral would make you want to take the pillows off the bed. I, too, was thinking of that; using the floral fabric as a panel on either side of the linen panels. I think that would be a stunning “frame” for the bed. If money allows, I’d buy enough of both chosen fabrics for the drapes. Perhaps use them seasonally. All of your choices are gorgeous and it will look lovely either way. Good luck! what if you also use your fabric to embellish the window treatments? you could have a band on the leading edge, or a wide strip of fabric running perpendicular to the window (i.e., parallel with the floor) traversing the window treatments. Or a cornice? Or a duvet cover that you just keep folded at the foot of the bed (I see a lot of beds where the actual bed covering is a matelasse or other solid cream, then the pillows and something at the end of the bed bring in pattern?). no matter what you choose, I know your room will look great. But would it help in your decision making to photoshop a photo so that you can better visualize your white/navy walls, linen window treatments, etc.? I thought the band of fabric would be great. I also like the idea of using it on an occasional chair or lumbar pillow for the occasional chair. Oh, I can so relate! You’re right. I just need to hurry and do it. I tend to way over think things. How about going with the idea & to incorporate more of the floral fabric, use it on an occasional chair/s. Those are always lovely to have in a bedroom. How about going your current the idea & then to incorporate more of the floral fabric, use it on an occasional chair/s. Those are always lovely to have in a bedroom. What if you did a double curtain with the floral fabric towards the window with the oatmeal fabric surrounding it? Hmmm…now that’s an interesting idea! I agree that you need more of the floral fabric … but not as curtains. I LOVE the linen idea for the backdrop to the bed. You could make cording out of the floral and use it on some solid pillow covers … or what about a bench at the end of the bed? Or on one cushioned chair [if there’s room]. Or a big bolster on the bed [like body pillow size] with floral cording and a floral panel in the middle? You’ll do fine! Just take a leap of faith and punch that purchase button! I agree with Vivian here, the large bolster I was going to suggest. but I like her idea about using cording with a floral middle on the bolster. Plus using some plain linen accent pillows with perhaps the floral twisted down the middle. as accent on the linen throw pillows. Yes I think that would really work especially if you made the bolster and throw pillows with covers you can change. That way if you decide to change the floral out for another design it should be fairly easy to change out. That way you can find more florals or patterns to make up more pillow covers, change with the season or something like that. That way it doesn’t get boring or stale. I’m really liking the idea of a bench or chair covered in the floral fabric. I like all of these ideas! I built an adaptation of it for a western theme bedroom and used nailheads for trim. I’ll post a picture on Matthew’s FB page for you. Hit that purchase button. It’s going to be beautiful!! I love the post by Lisa. Think of your choices as candy bars. I will remember that. I can so relate to the indecision. I hope I don’t bore anyone with my indecision but will share. We moved into a brand new open concept home 2 yrs ago. My decor style is more french country & my new living area is more contemporary. Beautiful cinnamon colored maple cabinets & woodwork w/ stainless steel appliances. The perfect color scheme for this room would be neutrals in grey, rust, golden beige & black. My existing furniture is denim blues, red area rug & gold. The red area rug is OK, but to my eye clashes a little with the brown/rust laminate floor. So, my dilemma is do I go more contemporary w/ my new furniture or go more contemporary? When I shop nothing speaks to me. I am a retired Interior Designer. I can do this for others but I may need to hire someone to do my own home. I have a hard time decorating open concept homes. It’s more challenging to be sure that all of the areas look cohesive! That one of the main reasons I wanted my house to have very defined rooms. I agree with the patterned floral fabric as pillows and accents. The problem with pattern is that after a number of years you may grow tired of it. It’s much less costly to sew new pillow covers and a bed skirt than to sew new draperies or reupholster a headboard. It will look lovely however you do it! Very true. And good advice, especially considering that the floral fabric is three times the prices of the linen! Yikes! That would be quite a lot to pay for something that I might get tired of in a couple of years. Sometimes looking at the colors in the dark can be very revealing. You were probably very right to pick the navy less grayed because the floral may have had the same effect on the grayed navy (washing it out even more) as the “yellow” walls are now. Seems that the pattern would be overwhelming used in the volume you describe as curtains and take over everything. Perhaps a more heavily textured headboard fabric in the navy would add the dimension you are seeming to seek. Maybe something knobby. It all sound lovely. Maybe a bench, chair seat, chair or frame a piece of the floral for the wall? Banding on the curtains? I think you’re right about the headboard fabric. I really like the navy linen, but it’s very thin (definitely drapery fabric and not upholstery fabric) so I’m not sure it would hold up very well over time with daily use. I like to lean in bed and work on my computer every morning and night. So I’ll most definitely look for some thicker, more durable fabric with more texture. Definitely take into consideration the durability of the fabric for the headboard. We, too, are “leaners” and our light colored linen-like fabric discolored badly over time. I agree on using the floral fabric on a throw pillow for a chair, on a bench, or even as a bed scarf or throw at the end of the bed. I wouldn’t use it as part of the curtains, only because you may tire of it and it’s easier to switch out pillow covers than to make new drapes. For the drapes, I’d do the oatmeal but then add a nice, heavy bottom border in the navy to break them up from the wood floor color beneath them. I would also add in just a few touches of the beautiful coral in the fabric to add a bit more pop to the room. Maybe a solid pillow, sheets, painted bedside table or candles. I think all the options are good, but I think if I were to do it, I’d want the print to be a focal, but more limited than the draperies. I’d probably put it as the fabric in the headboard. Then do the linen on the drapes as a nice contrast to the navy and a variation to the white. I’d use a combination of the colors on the pillows and bedding, especially with the navy. But that’s just me. I can’t wait to see what you do. Now that’s an option I hadn’t even considered! I like the idea of using the floral on the headboard! Hmmm…I’ll have to think about that. I second floral on the headboard!!! Why not use the floral for the headboard and jink the navy fabric? You’re going to have enough navy on the walls. The floral fabric headboard won’t show dirt or lint from the bedding. I can see the navy headboard having to be vacuumed way too often. Or, if you use the navy for the headboard, make a duvet cover from the floral and use it to cover the bed. I prefer the oatmeal for the curtains with no trim. But no matter how you decide to use the fabrics, the room can’t be wrong. I’m liking the idea of the floral for the headboard! I really like your original idea and hope that you stick with it. After all, when it’s complete, if you don’t like something you can always change it OR live with it a while and it’ll probably grow on you. I love the fabric and might use it in pillows and maybe to cover a bench or make a throw for a chair or the end of your bed. I didn’t read through all previous comments, but I think you should use that floral for your headboard. Your bed should be the focal point and the headboard is the crowning touch. I love the naval color and linen drapes! Classic, never out of style! I would not use the floral on the drapes. I think you will tire of it and it is quite busy. But whatever you decide, it will be great. BTW your posts about the trees energized me to get moving and call tree services for estimates. Beige is not in my vocabulary so I’d make the draperies in the print. As far as the width goes, how about to the edge of the nightstands? 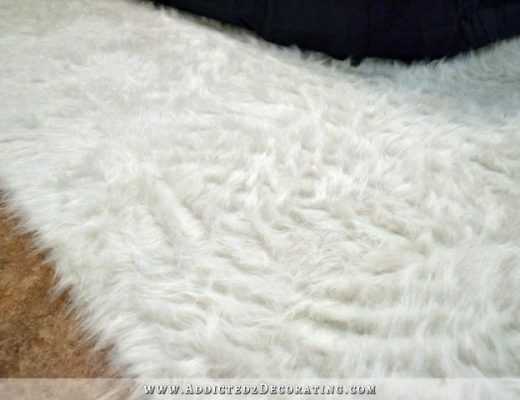 For the headboard, a sturdier fabric than the ones shown so how about a microsuede in one of the beige colors shown? Pillow shams in the floral with accent pillows in a combination of the fabrics. What is the bedding going to be? Are you going to have a dust skirt? Maybe not since you’re making the frame. Nope, I won’t have a bed skirt. I don’t want to cover up the frame that I’ll be making. Go with your plan, except do what previous posters said and use either a duvet cover or coverlet to bring in more of the floral. 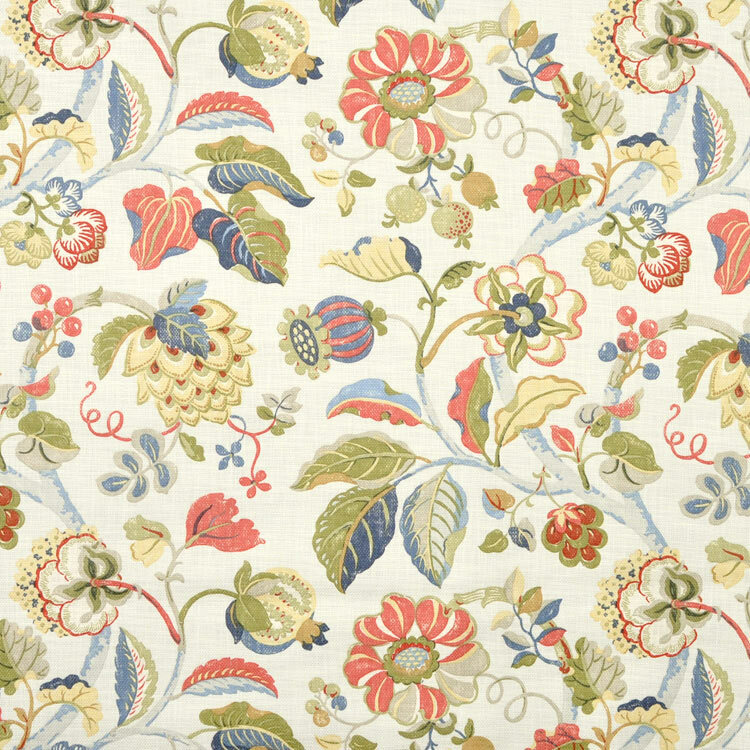 Also liked the idea of covers for the euro shams in the floral. Love both navy colors, but the naval is a more true navy to me, I think it is a great choice. Would also love to see more of the navy and oatmeal fabric somewhere on the bed besides just the headboard and curtain panels. That navy fabric is too pretty to just show up on the headboard. Maybe a couple navy throw pillows with floral trim. It will look great, no matter how you style it up! You could use the floral fabric to make the bedding or upholster an accent chair. Or maybe you could layer the curtains so there isn’t too much of one fabric. I can’t wait to see this room come together! Living vicariously through you! Have you considered using the floral pattern fabric on your headboard? I didn’t until a few others mentioned it, and I’m really liking that idea! What ever you decide, Kristi, we can’t wait to see the final outcome! In true Kristi fashion…it will be beautiful. With your eye for color, you are probably right. Here’s a crazy idea…paint a part of the wall your favorite plain white (with leftover paint?) just so you can truly see the colors without the drabbing effect of the current wall. It would take 20 minutes, but it might give you that great feeling of certitude. Good luck…you inspire so much creativity in your readers…just love your blog! Decorating your space should be what “you” love…it does not matter, in my opinion, where you put what pattern…but what your “gut” is telling you. I always go with my first pick…it never steers me wrong..and as long as I love it..that is all that is important. So, pick what you love and stop second guessing yourself…you can’t go wrong if you love it! And my motto is “when in doubt…buy”….it can usually be exchanged, returned or changed. This is funny for me to read because this is SOOOOOOO me when it comes to getting things for my house! I have lived in my house for two and a half years now and not one single room is done being decorated. Even if the price of a shower curtain isn’t that much, or the fabric is on sale, I have a hard time spending my money when I’m not completely sold! I totally vote for the printed fabric for curtains, with maybe a beige linen border and then do everything else more neutral except for a throw blanket and pillows that pick up the colors of the drapes. 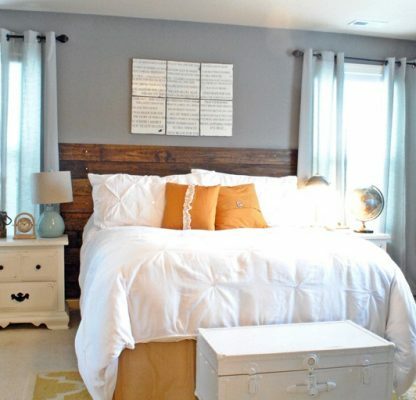 This would be especially stunning with the navy blue headboard. and wood. Swoon…. How about using the floral fabric as the drapes on the other window in the room? Then adding a band of the floral to the edge of the drapes on the bed wall, with a couple accent pillows thrown in on the bed. I think that would give you a good amount of that great floral. Just a thought for you to consider. I would use the very special fabric on the headboard, for pillows and a throw. This way, if you find a special fabric in a few years, it’s easy to change. Make the headboard so the fabric can easily be changed. Having fabric only on the pillows/throw means you won’t see it all the time. LOL…as I scrolled down to add my comment, reading others’ along the way, I realized I have nothing new or unique to offer! I love (a) the idea of making the floral a focus point on the headboard the most ! or (b) as a duvet cover or lastly (c) edging the curtains. It’s a beautiful floral and would not be overpowering on the headboard. Edging the curtains in it could pull it all together. I think you need to stop second-guessing yourself and just do it! The original plan sounds great. You are talented enough that if you don’t like it or get tired of it, you can just change it! I have yet to see you make a “bad” decision! Can’t wait to see how it progresses!! When I first saw the picture of the inspiration headboard, I thought you WERE using the floral fabric. So, of course, I agree with those that mentioned that! After all this in put I might be to late and you have pressed the purchase button just so we stop telling you our opinions. That being said I have a question. The bed you are making will it have a box spring? If so make sure you buy extra fitted sheets to cover your box spring because I can tell you are detail oriented and you will see your box spring when you fold back what ever bed cover you use. I love the wall color you chose because it has a more saturated color. The Linen and White will pop like a magazine and yet still be soothing. I think the fabric sample the sent you is ridiculous specifically the floral. I think texture is needed in the fabric for the headboard and dark color will show dust. A choice lesson from the past. The floral fabric will be great as pillows, coverlet, and bench with piping of Linen and Navy fabric. Also you could do the chair in the room in a Navy with Linen piping cord trim if it is near the curtain window wall. I would suggest balancing some of the Linen across the room so all the Linen isn’t piled on one side of the room. perhaps your chairs are facing your bed then do them in Linen with the Navy Linen for an Ottoman between the chairs. Just a thought with imagining your room. Can’t wait to see your completed room. I am sure it will be perfect for you and your family. Kristi, you may have pushed the purchase button by now!!! I work for a custom workroom and the possibilities with the floral fabric are endless. I do the same thing, second guess myself, but can do a clients house and never second guess my selections. I’ll trade with you, come do my living room and I’ll do your bedroom!!! One thing we’ve done to incorporate both fabrics is a 13″ wide pillow by 20″ long, on each end use your linen solid in the middle use the floral, use a decorative cord around the outer edges of the pillow and some type of trim between where the solid and floral are sewn together. Pillow shams in the floral would help to incorporate the floral without using to much. On your windows you could use the solid linen and insert a band about 18″ wide of the the floral fabric down from the top of the curtain about 12″. If you only do 1 width on each side of your window you will only need 1 yard of fabric to do the band at the top. Can’t wait to see the outcome I’m sure it will be beautiful!!! Love the colors you’re working with. I like your original ideas, Kristi. However, I think I would swoon if there were enough of that floral fabric to upholster a chair, maybe something on the order of a wingback or smaller. The floral fabric is the key to it all! I love this suggestion by Marci. The idea of an upholstered chair, maybe a bit overstuffed, in the bedroom is a must. Maybe you could make a cushioned bench at the foot of the bed. I’ve seen some clever ones made from coffee tables, end tables, almost anything. Maybe make some pillow shams…..
What about navy linen at the top of the drape and oatmeal linen bottom so that when the drapes are closed the walls are the same all around? I have a similar pattern for the drapes in the living room and adjoining dining room in my home. I LOVE the way it brighten up the rooms! That being said, if you’re going for a calm, peaceful look in your bedroom, it might be too busy in the panel curtains you’re wanting to add. Now I know Matt is no decorator….actually I do not know that, but it is a safe bet. Anyway, he knows you better than anyone. Your likes, dislikes, how often you like to change up a room or how long you like to settle in an enjoy a room. Do this….based on the comments, take 24 hours to come up with a plan B; with plan A being your original design. Pitch both to Matt and let him tell you which one you will be happest with. He did a great job with the appliances, he will do the same thing with the bedroom. Click ‘purchase’ and start building, painting and sewing. Making sure to document every step of the way so that I, (I mean we) can watch this beautiful room come together. And to change the subject back to trees. I hope you are going to post before, during and after photos. I am looking forward to seeing the outside transformation as much as the inside transformation. Enjoy your weekend! What about a verticle border on far outside edge and on the inside edge that frames the window above the headboard when open? Not sure how many panels but only far outside one and inside where open. Narrow navy then a bit wider floral then another narrow navy then linen then border again. Is that making sense? I like your choices. The difference in a client’s house vs. yours is that you have to live with it, so it doesn’t hurt to be certain. I’ve been doing the same thing with a piece of furniture. I personally think the linen would look best for your curtains. Maybe it’s just me, but I would find the floral to be too busy on such a big wall. But the fabric is really pretty. Maybe you could cover a chair in that fabric and have it match the pillows on your bed? And the stained headboard with navy linen would be gorgeous! I love the choice you made in the paint. That’s also the one I would have chosen… from your pictures. If you need a larger swatch of the fabric, maybe you could print it out and use that to get an idea would something would look like. Not sure if the colors would print accurately, but it’s an idea. Can’t wait to see your final choices! I would probably think “what would Sarah Richardson do”.. and browse her bedrooms on Pinterest. She’s used feature prints as banding on drapes, headboards, an entire chair. etc. So any of those you can’t go wrong. But agree with someone else’s comment above – This print is the jumping off point and needs to be used on something more than a couple of pillows. To use it on the drapes or headboard I think you need something special on the bed. Like a great quilt that compliments the room colors. Which is what Sarah does a lot. 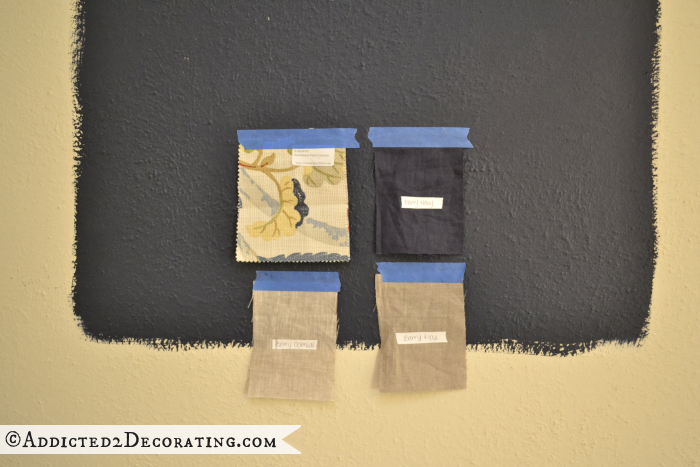 Something to ensure the fabric is not the only pattern in the room since you plan to use navy on the walls. The contrast will be significant using the bold wall color and drapes or headboard in the print so my vote — add in more patterns or textures if you do that so you don’t get tired of the look or put the print on a chair and stay with your choices for the drapes/headboard. Have fun! I love the paint color you have chosen and think the white wainscoting will look beautiful against it. 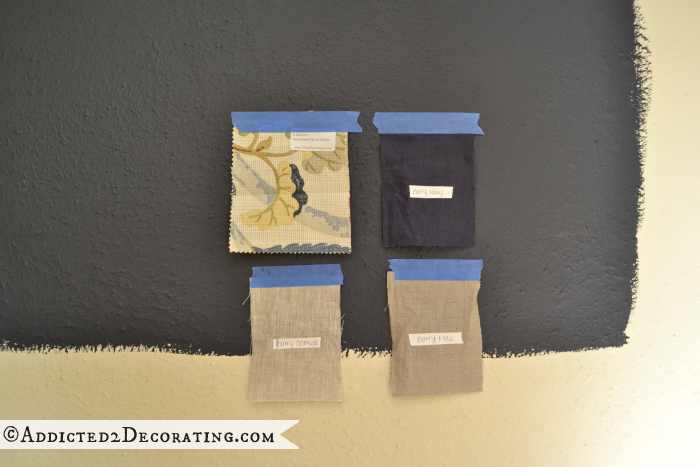 The oatmeal linen curtains will work well with the navy now and with something else if you decide years from now to change your color scheme. I love the floral, but you need more of it in the room besides a few pillows. 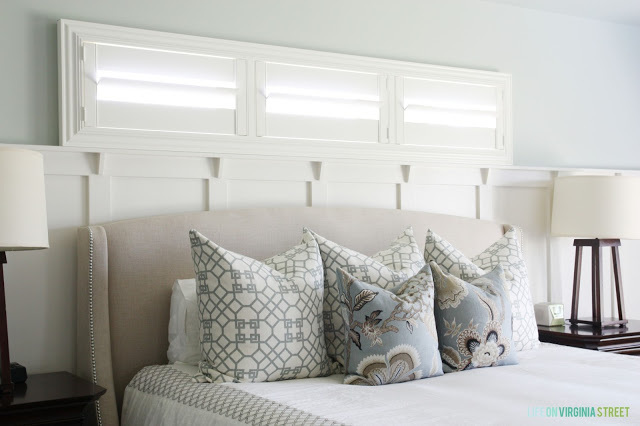 The idea to use it on the headboard is a great one, it will hold up better than the navy and you will have plenty of navy already from the walls. Use the floral also on a chair or bench at the foot of the bed. Use some of the other colors in the floral print for your throw pillows, it will tie everything together. Where do you source your fabric? I see so many lovely fabrics on your site but don’t know where I can find stuff for my home. Thanks. Okay, I may be Sister Repeat here, but I didn’t read every comment above, so forgive me if I am? I think maybe the curtain banding or even a cornice of the floral with the oatmeal below. My thought is the cornice board, then a small throw for the bed or an ottoman cover if you are having a chair or a bench for the foot of the bed. I’m sure whatever you do with be fabulous. I’m definately feeling the thought about wanting to make sure you 100% love a choice before putting one thin dime into buying that choice! You’re certainly not alone with that concern. Love what you’re planning! I think the first idea sounds lovely, and NOT boring. Where are you buying your fabrics from? Maybe upholster the headboard in the floral fabric! All your choices are so beautiful! Whatever you decide will be amazing! I am EXACTLY the same way. I second guess myself all the time on my own home and end up making some mistakes (which of course are usually fixable when I have the time and money). 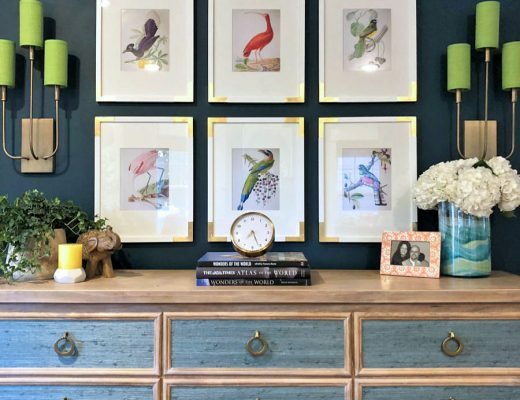 Right now my own home is a hodge podge as I have many projects and changes to do in every room, but I can usually go into someone else’s house and in an instant design their room(s) without even flinching. Now why is that? Hmmm, one never knows! As far as your dilemma, I love all your fabric choices, however, I think I would go somewhat easy on the floral pattern. Too much could have you redecorating soon. If you want it for more than just pillows how about making a duvet cover out of it too. You can then either use it as bed cover or lay it at the foot of the bed when you want a lot of floral and then put it away for a while when you want another pattern. That would be much cheaper than draperies but still give you “enough” of the fabric for the space and it’s easily changeable if and when you do redecorate or your tastes change. Just a thought and happy decorating! I made a similar headboard (sans nail heads) using the Fjellse bed from ikea (could also use Tarva). I left out the headboard slats and cut of the extra bits of wood that stick up from the posts so it was square. I cut a pc of plywood to size minus the thickness of the brackets & the thickness of my fabric. I used heavy duty corner braces (the triangular ones) to attach the plywood (with foam) to the frame. I decided to velcro my upholstery on instead of nail so i can wash it.